Jeremy (aka adventureR) from the tenkara forum posted about a fun game he calls “Knothead Trout”. It’s not only fun, but is a great way to improve casting accuracy. And to me, the “fun + simplicity” formula is the most successful way to learn anything–especially fly fishing. 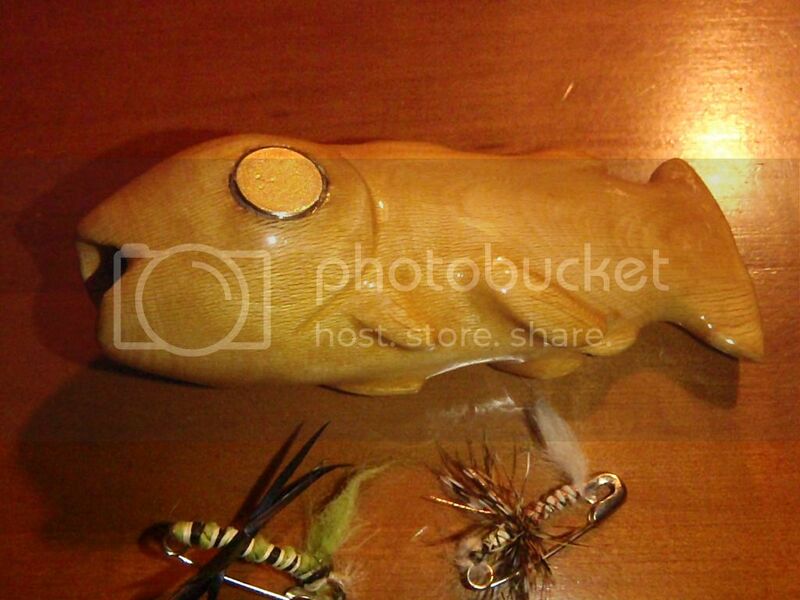 First, he carved a trout out of wood and added magnets for the eyes. Then, he tied what could only be described as a “safety-pin kebari”, also with magnets. The goal is to cast your saftey-pin kebari close enough to the wooden trout so that the magnets catch each other and you can pull it in. At the Summit, we had a contest with some really cool prizes. The rules were slightly different though. You got five casts and you were only allowed to “manipulate” the fly once (for lawn anglers, that means dragging your magnetic fly across the lawn closer to the target). Dr. Ishigaki even gave the game a try. He didn’t win anything though. But after getting to know him a little, it wouldn’t surprise me if he intentionally took a dive so that others could have a chance at the cool prizes he donated. My impression is he’s just that kind of guy but would never admit it. I was surprised by how many novices were actually able to be accurate enough to catch the prize. But then again, maybe I shouldn’t be as one who always touts the ease of tenkara. At any rate, the contest was fun, those who participated learned something, and the winners got some great prizes. How cool is that? Many of us might practice our casting on the stream, but it’s probably better to not waste valuable fishing time to refine your cast and practice in the off hours in your backyard when you can’t actually go fishing. You don’t have to do anything as elaborate as hand carve a detailed trout from wood. It could be something as simple as attaching a magnet to some other lightweight object and slapping a magnet on a safety pin to be your “safety pin kebari”. Either way, it is an effective way to hone your accuracy, get used to a new rod, or just have fun with kids or tenkara novices. I don’t know about you, but I can see this blossoming into an official event at the inevitable “Tenkaralympics”. Yes! Glad you found the game fun and a good casting hone. Also Dr. Ishigaki might find it good for vision exercise in his field of study. Yes! Looks like goal acheived, so nice to contribute to my favorite way to fish. Kudos to adventureR for coming up with Knothead Trout. People were really having fun with it, and it definitely adds more excitement to the typical plate targets that are usually used for lawn casting practice. I was also surprised at how well novice fly casters did at the game. Thanks Brian, & Daniel I guess after the pins are stuck to the magnets for a while they too have a bit of magnetism, so I didn’t say anything. I’m so glad the game is liked by our Tenkara community. Thanks for putting it out there Daniel for everyone to see. Feels good to think Tenkara anglers all over the world could be making and playing the my game. When I took that rod from you, I had no idea there was limit to the number of casts you could take! I can’t thank you enough for holding the summit here in Salt Lake!